Over the coming week a compact unmanned space probe called New Horizons will fly by the dwarf planet Pluto, making its closest approach on July 14th. This is the first time a spacecraft will have visited this far off world. So remote is Pluto, at almost six billion kilometres from the Sun, and so small is it (just two thirds the diameter of our Moon) that since its discovery in 1930 we have been unable to determine much about the character of this little but important world. That is about to change. It is worth contemplating that, whether intimately involved in the New Horizons mission to Pluto, or a member of the public witnessing it unfold from afar, we will all share in this imminent transition from not knowing, to coming to know, Pluto. Nobody is excluded – we will all share the sense of discovery about to unfold. This is the last moment of significant discovery of a traditionally regarded major world of The Solar System. So the time for engagement with this mission is from now – just before the flyby – to experience the full extent of the close encounter and transition from almost total ignorance about this world, to coming to know it as we have come to know the other planets. And there are potent ways across numerous modes of communication and connectivity to follow New Horizons (see the “List of Resources” section in the second blog in this series “New Horizons to Pluto and The Kuiper Belt – Part 2”, for pointers on how to follow the New Horizons mission via smart-phone, social-media and online over the coming weeks and months, and next four years of the extended mission beyond Pluto). The quest to find and characterise Pluto has been a one hundred and seventy year quest to understand the nature of The Solar System at large. It is a quest still incomplete to this day, and the primary reasons we are going there. To understand the nature of this quest, we must consider why a search for a ninth planet was initiated in the first place. Only five other planets are visible in the sky to the unaided eye – Mercury, Venus, Mars, Jupiter and Saturn. So it wasn’t until well after the invention of the telescope around 1600 that the seventh planet, the gas giant planet Uranus was discovered, in 1781. Over time, it became clear that Uranus’ orbit did not fit with Newton’s theory of gravity used to explain how the planets orbit the Sun; and while some questioned the legitimacy of Newton’s theory, thankfully others held off from throwing out the baby with the bath water, and a search was initiated for yet another (eight) planet that might be perturbing Uranus’ orbit and explain the discrepancy. That search lead to the discovery of the gas giant planet Neptune in 1846. Although the presence of Neptune largely explained the irregularities in Uranus’ orbit, further studies suggested that the orbit of Neptune itself might also be irregular, perhaps because of yet another hitherto undiscovered planet – a ninth planet even further out in The Solar System. The extent of irregularity in Neptune’s orbit was less than for Uranus however, and doubt was expressed even at the time as to whether there was sufficient irregularity to require the existence of an external influence. On occasion, lingering and unresolved scientific episodes like this capture the imagination of some from outside the field, and in this case the enigmatic character of Percival Lowell entered the story in the late nineteenth century. Lowell was a wealthy American businessman, a fervent amateur astronomer and the person most responsible for perpetuating the contention (which survived in some quarters until the 1960’s) that there were canals on Mars built by a race of Martians. Lowell set up a well equipped observatory in Flagstaff Arizona in 1894 from where he observed what he claimed to be dozens of planetary-scale Martian canals, and even claimed to see new ones where before none had been seen (a process he called ‘gemination’). True to character in engaging a potentially sensational celestial story, Lowell also took up the challenge of searching for a ninth planet, which he designated as “Planet X” (where X means unknown, and not the Roman numeral for ‘10’). Despite extensive searches over a number of years, Lowell found no trace of a ninth planet. He passed away in 1916, but in his will he left one million dollars both to his observatory and to the search for Planet X. After a decade of legal complications regarding that contentious aspect to his will, a new telescope was commissioned at Flagstaff in 1927 specifically for the task of finding Planet X. A young and enthusiastic amateur astronomer called Clyde Tombaugh (Figure 1) was hired to conduct the new search, which he did with dedication and precision. Starting in 1929, Tombaugh systematically took thousands of photographic plates of the night sky along the Ecliptic (the path around the sky along which the Sun, Moon and planets appear to move). He used a device called a blink comparator with which he could flick back and forth between any two photographic plates taken of the same patch of sky on different nights, examining them by eye to see if any object, such as a new planet, could be identified in different locations on each plate as it traversed the sky. 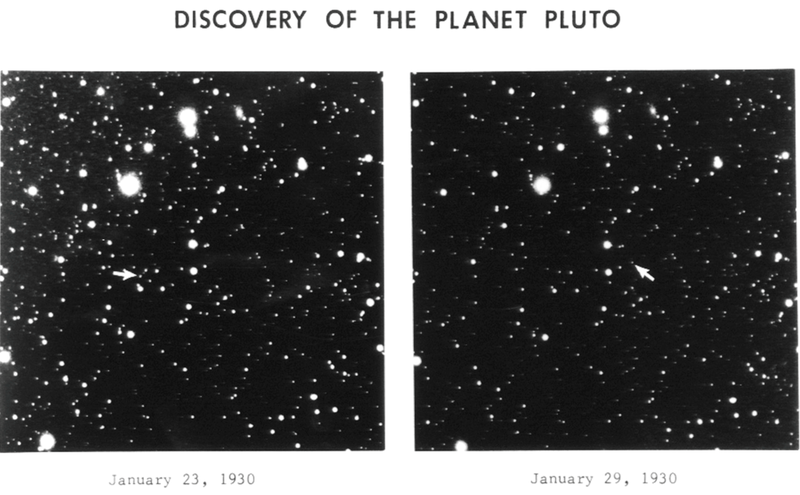 Within one year, on February 18th 1930, Tombaugh spotted a new world moving among the background stars across two photographic plates he had taken on January 23rd and January 29th that year (Figure 2). Calculations quickly revealed the orbit of the new world to be beyond that of Neptune, while early estimates also suggested it might be as large as Earth (best estimates ranged between 0.1 and 0.9 Earth masses). And so it seemed that Planet X had been found, and was given the name Pluto – named in a competition by an eleven year old girl from Oxford called Venetia Burnley (1918-2009); though some claim it was named Pluto because the first two letters in the name are the initials of Percival Lowell! 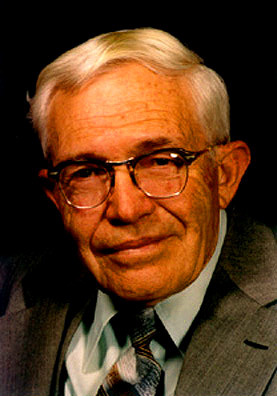 Tombaugh lived from 1906 to 1997, and it was a pleasure to see him being interviewed by Sir. Patrick Moore on the BBC’s The Sky at Night in the 1980’s, where he described, in the most humble of terms, the extensive effort involved in discovering Pluto. And in that description – the mention of a “third zone” of The Solar System – lies the pointer to the continuation of the story of The Planet Pluto and why we are visiting it now. In 1978 it was discovered that Pluto had a moon, given the name Charon, the discovery of which finally allowed for an accurate determination of the size and mass of Pluto. It was found that Pluto was far smaller than previously thought, with a diameter of about 2500 kilometres and a mass far less than that of Earth (now known to be only 1/500th that of Earth). If there was a Planet X influencing the orbit of Neptune, Pluto wasn’t it. While some searches were conducted to find a tenth planet (a true “Planet X”) between 1978 and 1992, improved measurements of Neptune’s mass, by virtue of the Voyager 2 spacecraft passing Neptune in 1989, all but eliminated the need for any corrections to its orbit or for the need for a Planet X beyond Pluto. But the more recent searches were not made in vein. Firstly, the 1978 and subsequent measurements of the Pluto-Charon system revealed Charon to be quite large, with a diameter of about 1200 km and orbiting at only a distance of about 20,000km from Pluto; making this an intriguing system of two small planet-like objects perfectly synchronized in their movements through gravitational resonance (also known as tidal locking). Both Pluto and Charon orbit about their common orbital barycentre (centre of mass, a point residing in space about one thousand kilometres beyond Pluto’s surface) every 6.4 Earth days; while a ‘day’ on each world is also 6.4 Earth-days long, with each world therefore only ever showing one face to the other, in much the same way that our Moon only shows one face to Earth. Furthermore, visual detections began to emerge of a large number of other smaller objects beyond the orbit of Neptune. By the early 1990’s it was realised that stretching out in vast belts from just beyond Neptune at 4.5 billion kilometres, to a distance of more than 8 billion kilometres, are countless millions of minor worlds ranging in sizes from less than one kilometre to several thousand kilometres in diameter. This region is now called The Kuiper Belt, named in honour if the Dutch-American astronomer Gerard Kuiper, the foremost planetary scientist of the first half of the 20th century. Today it is hypothesised that The Kuiper Belt contains upwards of one trillion tiny icy worlds, with a combined mass of two hundred times that of The Asteroid Belt between Mars and Jupiter. Indeed the Kuiper Belt may contain as many as one hundred thousand minor planet-like worlds with a diameter greater than 100km, and with some of them the size of Pluto. Several Kuiper Belt worlds about the same size as Pluto have been discovered in recent years, three of which are named Makemake, Haumea and Eris. Our recent studies of the Kuiper Belt, as incomplete as they are, have radically altered our understanding of not only the outer Solar System, but also of the origin and evolution of the entire Solar System itself. For example, two distinct categories of objects within the Kuiper Belt have been identified – the so-called Plutinos or Hot-Population which orbit the Sun in highly elliptical orbits that on occasion come within the orbit of Neptune, and which tend to be grey in colour (and of which Pluto is the primary member); and the Cubewanos (pronounced Q-B-ones) or Cold-Population which reside in more circular orbits further out, which don’t cross the path of Neptune and which tend to be more red in colour (and of which the Kuiper Belt object Makemake is a member). We also see another, more dispersed belt of object called the Scattered Disk, made up of millions of tiny worlds scattered over a wide belt beyond Neptune but at steeply inclined orbits around the Sun, of which Eris is a member. It seems that the range of categories of worlds in our Solar System is far more diverse than ever realised. It is also becoming increasingly evident that acquiring comprehensive details on the range, number and character of such worlds will provide important new insight into the origin, evolution and history of The Solar System. Why? – Because it appears that the worlds of the Kuiper Belt did not originate in their current locations, but were shepherded there over the ages through gravitational orbital resonance by the four giant planets Jupiter, Saturn, Uranus and Neptune. And so by understanding the full nature of the Kuiper Belt, we will uncover new details of the history and evolution of activity across entire Solar System since its birth. We could regard the study of such worlds as a kind of “celestial taxonomy” – the classification of object types and characteristics as a way of coming to know the natural history of The Solar System. In biology, taxonomy has lead to a deep understanding of life on Earth – not just a description of life-types on Earth today, but also on why there is biodiversity in life and its relationship to its evolutionary natural history. Similarly, through the improving classification and characterization of the worlds within the Kuiper Belt, we will learn more about how they came about and evolved over time. And so, in this recent and maturing perspective of The Solar System, Pluto has come to be regarded not as a planet like Earth or Jupiter; but as a newly identified category of world called a minor planet, and as a primary member of the Kuiper Belt. As a result, the International Astronomical Union (IAU), in 2006, officially moved Pluto into the newly designated category of minor planet called a dwarf-planet. We might say that it was the search for Pluto that finally brought us to our first comprehensive view of true nature and history of The Solar System. It is the prime example among many newly discovered worlds that compel us to contemplate what are planets, and what aren’t planets; and in so doing push forward our understanding of the actual system we live in. The old view of nine major planets orbiting the Sun in never-changing orbits is not correct. Rather, we live in a dynamic system containing a huge range of object types, all governed largely by planetary gravitational forces primarily from the four gas giant planets; which over the eons have interacted with one another as well as the countless smaller worlds – shepherding them into resonant orbits and belts based on close numerical or harmonic ratios (for example Pluto orbits the Sun twice for every three Neptune orbits), creating the extraordinary Harmony of the Heavens which we see today throughout the entire system. And by unravelling the precise sequencing of events on how this came about, we hope to gain a better perspective on the origin and history of all the worlds of our system. Indeed we have made strides in that direction already. New models of The Solar System indicate that the so called Plutinos originated closer in to the Sun near Jupiter, and are therefore of totally different material makeup and origin to the Cubewanos which seem to have originated further out near Neptune. Meanwhile the orbits of all the major planets, and especially the four gas giants, have moved significantly throughout history, settling into harmonic resonances with one another (for example Jupiter orbits the Sun about twice for every one Saturn orbit); all the while the Kuiper Belt has been assembled from countless billions of world-lets from various parts of The Solar System and shepherded into regulated belts beyond Neptune. While such dynamism and harmonic movement is now known to have happened in the past and indeed continues today, we are far from a complete picture; and our best models contain significant inconsistencies. For example, current models predict fifty times more mass in The Kuiper Belt than we can see; while it is also unclear why many of the Plutino objects possess moons or are twinned with other objects, while none of the Cubewanos exhibit this feature. So we are far from a complete picture. But we do have the means at our disposal to improve our understanding; from improved theoretical models to observations using the likes of The Hubble Space Telescope, and of course by travelling to The Kuiper Belt to investigate some of those far off worlds close up. This is an on-going quest. The consequences to achieving a comprehensive understanding of origin and evolution of The Kuiper Belt are significant not only to understanding the natural history of our Solar System, but also toward a better understanding the origin of life on Earth. Not only will those ancient and far off worlds provide details on the water, other volatile materials such as methane and carbon dioxide and organic materials in the Sun’s proto-planetary disc during planet formation; but unravelling the full dynamics of our Solar System’s early history will provide powerful insights into the origin and evolution of all the worlds of our system, as well as the distribution and availability of biogenic materials. Currently we are very much in the dark on whether life even originated on Earth, let alone on mechanism that originated life; but we know that the conditions of the early Solar System were critically important; and we now know that many of the answers we seek reside in space and in The Kuiper Belt. And, a more comprehensive understanding of our own Solar System will provide details on the formation and character of solar systems and planets everywhere, helping us to gain a better perspective on a broad context for solar systems – and life – elsewhere in the Universe. And so it has turned out that the detailed investigation of the dwarf-planet Pluto and other Kuiper Belt objects is among the most important scientific investigations we can conduct, the answers to which will provide valuable new insights into some of our deepest questions on origins and a universal context for planetary systems and life itself.